Note: All EGI Magnetic Erasable Boards has a protective film that needs to be peeled off before use. EGI Magnetic Dry Erase White Board adds perfection to your office or home with affordable price. Its light colored aluminum frame blends into almost every background wall you can imagine. Dry Erase Board, unlike Cork Board and chalk board, does not leave any trace of mark even after years of use and can be cleansed with water if desired. 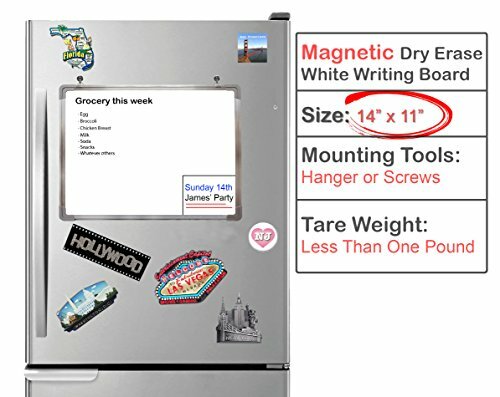 Our magnetic writing board does not require drilling or any type of damaging to the area you are hanging it. The two triangular hangers can practically hang on to anything from kitchen hanger (those types that can be stick to the wall or, better yet, the ones that's magnetic and sticks to refrigerator). Lastly, and most importantly, it's LIGHT, like really light (exceeding no more than 15 lbs. for our largest board and as light as 8 oz. for our smallest board). LifeTime Warranty - Life Time Warranty on any of EGI Writing Board with proof of purchase. Can Be No Tool Installation - Can be hanged on Magnetic Hook, Wall Hanger(Not Included), or other types of hangers. / Can also be installed using provided screw set on the wall. If you have any questions about this product by EGI, contact us by completing and submitting the form below. If you are looking for a specif part number, please include it with your message.